These were taken Monday morning, when the rains first came. 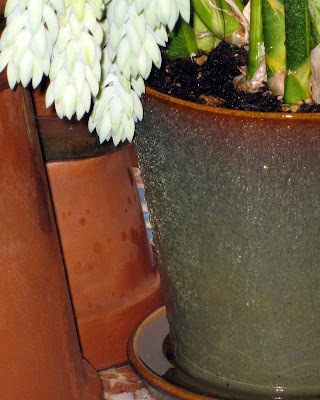 These are some of the pots on my patio table, overflowing with rain water. We always need rain in Southern California; the plants are happy, the lawns are happy, and the rivers and streams are happy. I'm happy, too. Check out the other Watery People here. Glad your plants are happy! They certainly look vibrant. 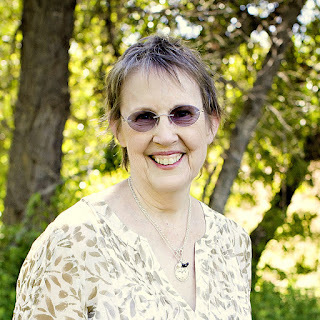 They are overflowing with Health and Abundance. This exuberance will overflow positively onto you then. Aren't you glad we finally got some rain! My yard was just a little flooded until the water got through the bricks and rocks but it really needed it. Looks like Burro's Tail. Good that you are getting rain. It is snowing here, and freezing rain for tomorrow. Something we DON'T want. So glad you finally got the badly needed rain. Those plants look like you've given them the water they need - they are beautiful! 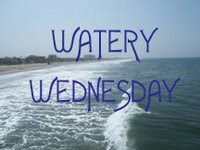 great shots and so different for Watery Wednesday. 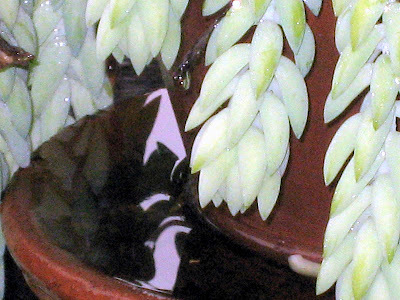 Potted plants with their cups running over - unique photos and very nice on a Watery Wednesday. Nifty. Interesting reflections in the saucers, reminds me of something - folded origami animals maybe? It rained here too. Looks like the plants got watered good. Rain is a wonderful thing, isn't it? No matter how much we water our plants by other methods, they always seem happiest after a good rain. Very unique shots, I like it. Thanks for sharing. 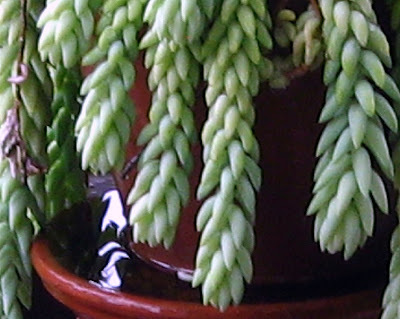 I have burro's tails plants that I have had for over 30 years now. They are so lovely. Too much rain and not enough sunshine does not keep them happy though!! Yours look great!